The material on this page is currently undergoing work to be refactored in a future release as further analysis is done, for example as part of the Genomics Reporting Implementation Guide . Rapid advances in sequencing technologies, clinical genetics tests for whole genome and exome sequencing are allowing sophisticated genetics testing to be used by providers and patients in clinical decisions. Results from such tests are used to identify distinct genetic variants that may contribute to syndromes, conditions and/or predictive responses to treatments. The implementation of precision medicine will depend upon having such data to diagnose patients, choose medications, and predict the course of disease and care, but will require standards and effective user interfaces. A current technical challenge exists in interoperability, the ability to access and share clinical and genetics data. The challenges of interoperability includes collection, coding, and retrieval to scale. An individual's genetic data set is large, complex and requires curation. Unfortunately, incompatible systems and nomenclatures are already in use. A standards-based ontology that could be adopted to integrate both genetic data and clinical information systems will be crucial to accelerating the integration of precision medicine and to make sense of genetic testing results in a complete clinical context. One approach for collecting, coding, and retrieving genetics data comes from the Global Alliance for Genomics and Health (GA4GH). The GA4GH organization has built and is refining an API and data model for the exchange of full sequence genomic information across multiple research organizations and platforms. The GA4GH focuses on the needs of researchers. A second approach is evolving from HL7 through FHIR. FHIR is attractive because it is relatively easy to implement because it is comprised of a set of modular components called resources, which can be easily and incrementally assembled into working systems. The clinical requirements for genetics data is, relative to genomics research needs, utilitarian and reductive because it is about distilling and extracting particular genetics data produced by ever more sophisticated testing for use at the point-of-care. 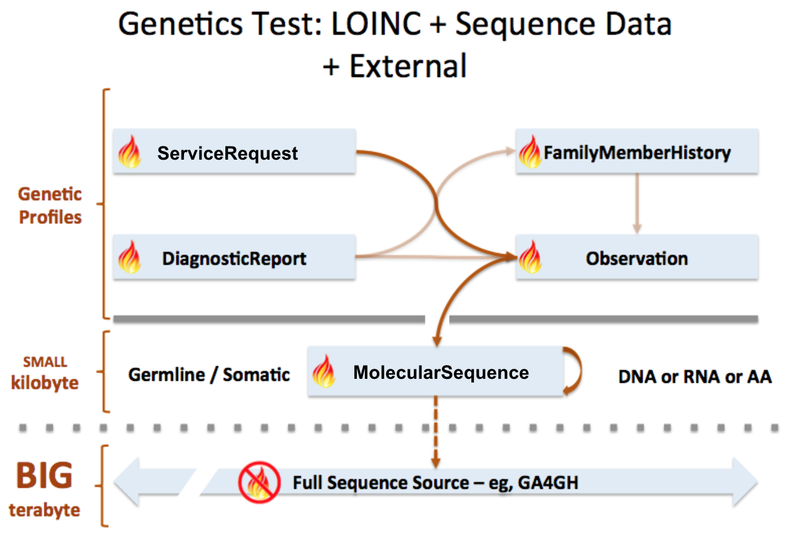 This has made FHIR a very functional framework to initiate an interoperable clinical genetics data standardization to which multiple stakeholders have contributed to this guide. 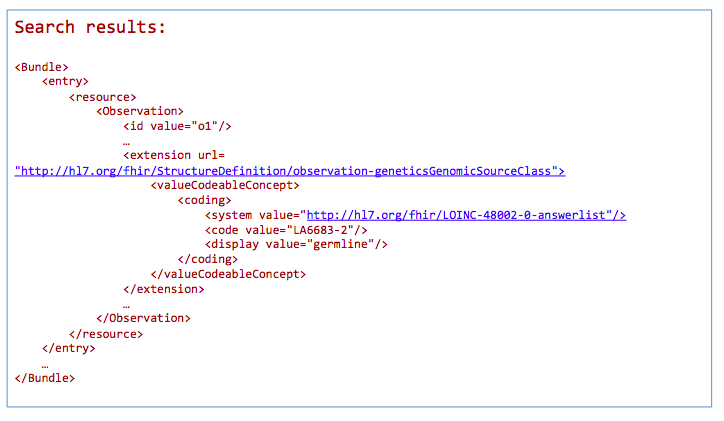 FHIR DSTU2 introduced a standard genetics profile that applies to the FHIR Observation resource. Using this profile, Observation payloads can return genetic testing results in a standardized manner. Extending Observations rather than creating a new, dedicated FHIR genetics data resource is consistent with the FHIR community mandate because it only adds new resources to an existing resource library when there is a compelling case to do so. We provide the case to add a MolecularSequence resource in this specification. STU3 moves beyond FHIR DSTU2 Standard Genetics profile on Observation allowing increased granularity and less ambiguity by creating a new resource to be called MolecularSequence. This resource will be used to hold clinically relevant sequence data in a manner that is both efficient and versatile integrating new and as yet undefined types of genomic and other -omics data that will soon be commonly entered into health records for clinical use. MolecularSequence will be leveraged by other FHIR resources, including Observation. This is consistent with how all FHIR resources are designed and used. The September 2014 Informative Ballot (“HL7 Clinical Genomics, Domain Analysis Model: Clinical Sequencing Release 1”) provided guiding use cases, which initially informed development of the initial Standard Genetics profile that is found in FHIR DSTU2. The same use cases also led to a second Project to develop a MolecularSequence resource (“Develop FHIR sequence resource for Clinical Genomics”). 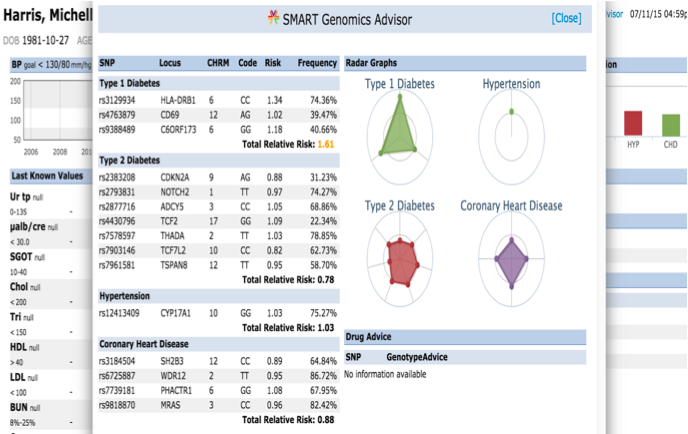 A preliminary effort to address these issues has been explored and published in context of the Substitutable Medical Applications and Reusable Technologies (SMART) Platforms Project and described in an article (“SMART on FHIR Genomics: Facilitating standardized clinico-genomic apps ”). 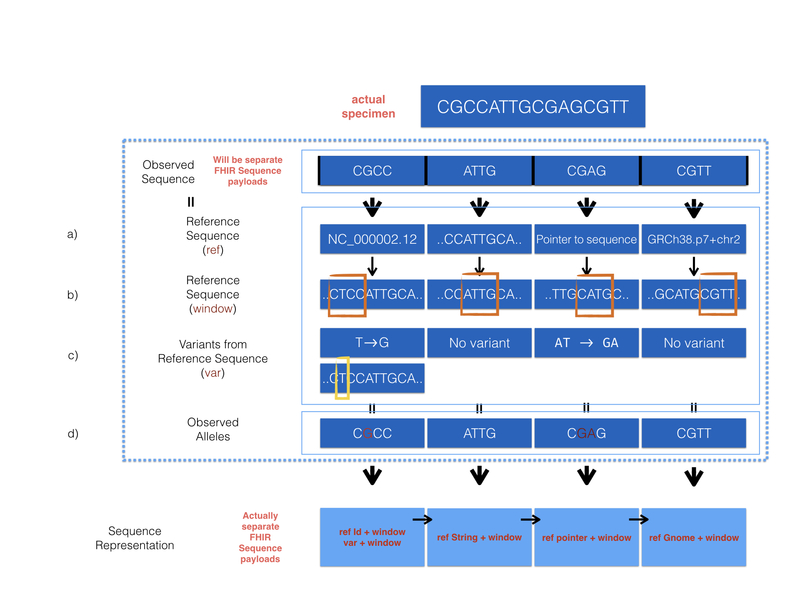 MolecularSequence is designed to hold genetic sequences in blocks relevant to actionable clinical decision-making. Extensions to MolecularSequence address complex cases and can associate it with repositories for retrieving a patient’s full sequence data, such as those defined by GA4GH. Other changes include a suite of genetics profiles for other FHIR resources. In addition, the Observation-genetics profile adds new references so that an Observation can report genetics test results to be integrated into the EHR. There are also new genetics-extension profiles for DiagnosticReport, ServiceRequest and FamilyMemberHistory, respectively, to extend them to report genetics results. We have given all of these FHIR genetics profiles the suffix “-genetics” (e.g. “DiagnosticReport-genetics profile”). New profiles on top of DiagnosticReport have been created for reporting HLA genotyping results. With these resource and profiles, FHIR can support a large set of clinical use cases (see Section 9, 10 , and 11) and is thus positioned to address all emergent -omics use cases, including Next-Generation Sequencing (NGS). These tools are simple to implement, will optimize payload sizes, and help developers avoid redundant retrieval of data. Appendix 1 of this document shows how DSTU 2.0 can be mapped to the new additions to the resource. exact Σ 0..1 boolean Does the structural variant have base pair resolution breakpoints? MolecularSequence.referenceSeq.genomeBuild, MolecularSequence.reference.chromosome: The combination of genome build and chromosome. The window selects a range from the reference sequence (or genome) that is used to define building block of a current sequence (e.g. MolecularSequence resource instance 1). MolecularSequence.quality: Quality scores for bases in the sequence. It is intended to be compliant with emerging regulatory needs needs (eg: those found at PrecisionFDA ). MolecularSequence.variant: This complex element is used for encoding sequence. 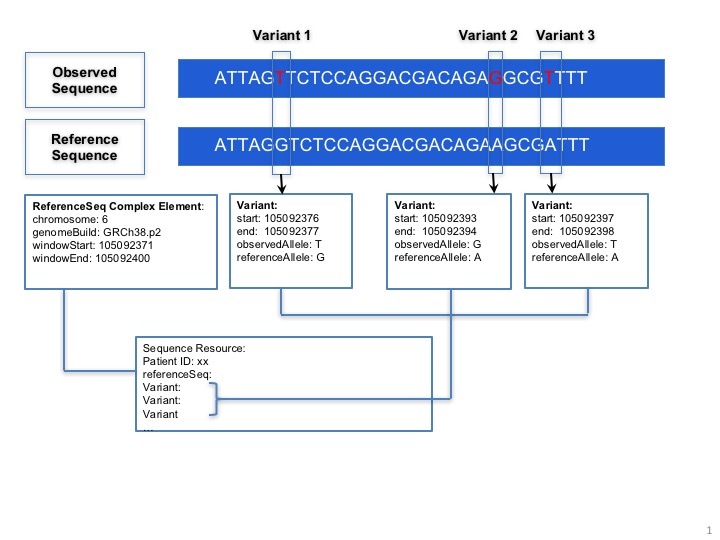 When the information of reference sequence and variants are provided, the observed sequence will be derived. MolecularSequence.patient: This element points to a Patient identifier to show that this sequence is related to the same patient. MolecularSequence.specimen: A pointer to specimen identifier, if needed. MolecularSequence.pointer: A pointer to a MolecularSequence instance for the next sequence block to build a sequence graph. MolecularSequence.repository: This complex element is used to provide a clarifying structure, a base URL, and/or relevant IDs when referring to an external repository. GA4GH Repository Example. If the MolecularSequence resource refers to a GA4GH repository for read info, references to a GA4GH full sequence dataset should conform to GA4GH data models and accessed via the GA4GH API. The URL of a GA4GH repository, ids of a GA4GH variant and read group are contained in the MolecularSequence resource. The URL of a GA4GH repository is an api_base of a GA4GH server that could be called for sequence data. The GA4GH variant set is a collection of call sets and the GA4GH call set is a collection of variant calls, typically for one sample. A variant call represents a determination of genotype with respect to that variant. VariantSet definition: A VariantSet is a collection of variants and variant calls intended to be analyzed together. CallSet definition: A CallSet is a collection of calls that were generated by the same analysis of the same sample. A read group is a collection of reads produced by a sequencer. A read group set typically models reads corresponding to one sample, sequenced one way, and aligned one way. 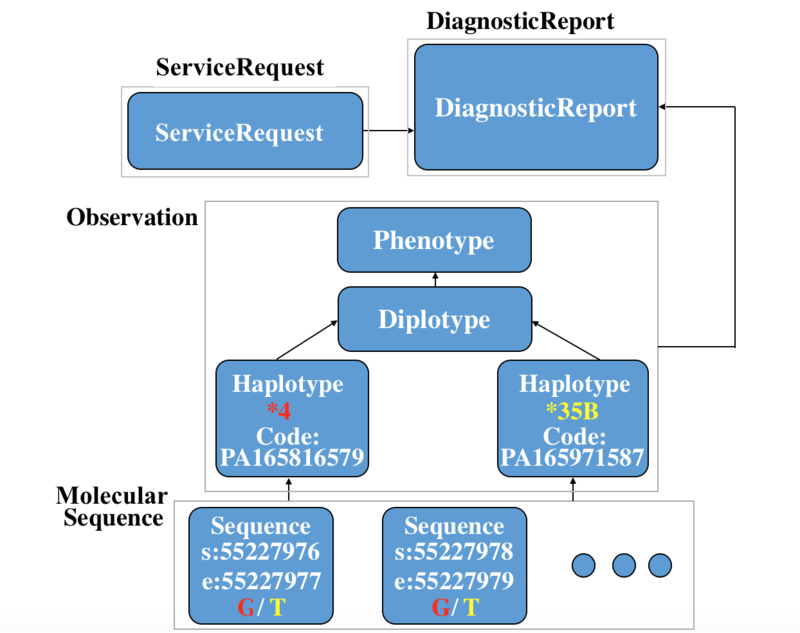 The API reference of Google Genomics is a GA4GH repository built by Google and provides details of the data models, such as the resource representations. We provide a detailed example to show how sequence resource can be used to represent record of observed sequence by different method. We provide one example to show how precision FDA vcf data can be upload and comform FHIR specification, and how quality in sequence resource is represented by comparison between a reference sequence and the observed sequence. 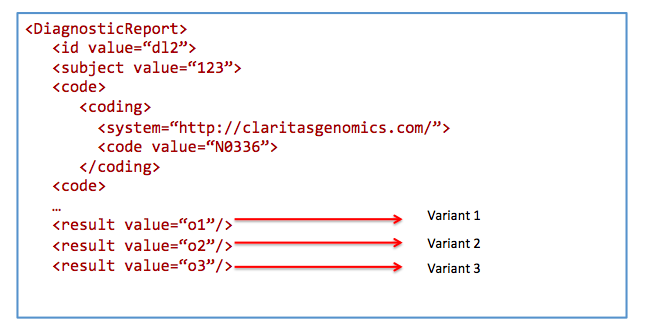 We provide one example to show how a complex variant can be represented with the help of cigar. The deletion, insertion and mutation is represented in characters along with the number of repetition. The Observation-genetics profile Observation-genetics profile is used to interpret variants from sequence resource. Clinical usage may need more specific representation of variant at locus or structural variant in whole genome. The observation-geneticsSequence extension will refer to the MolecularSequence resource for sequence information related to this variant. 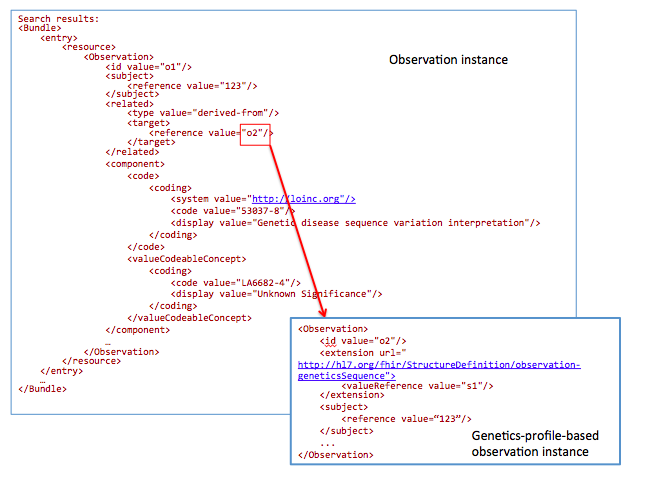 The observation-geneticsInterpretation extension will refer to an Observation instance which contains clinical interpretations for the variant described. 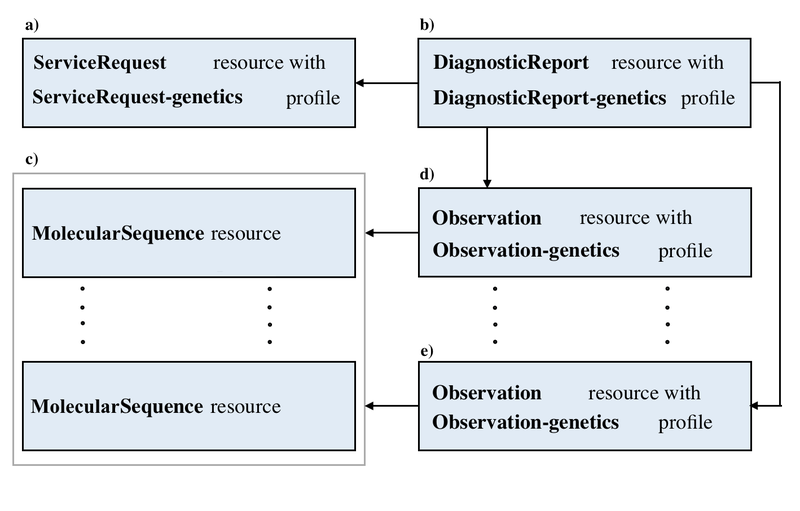 The code, effective[x], issued, performer, method, specimen elements can be used to describe how the genetic observation (variant and sequence data) is obtained. Other extensions are used to describe attributes of this variant such as Genomics Source Class, Amino Acid Change Type, etc. 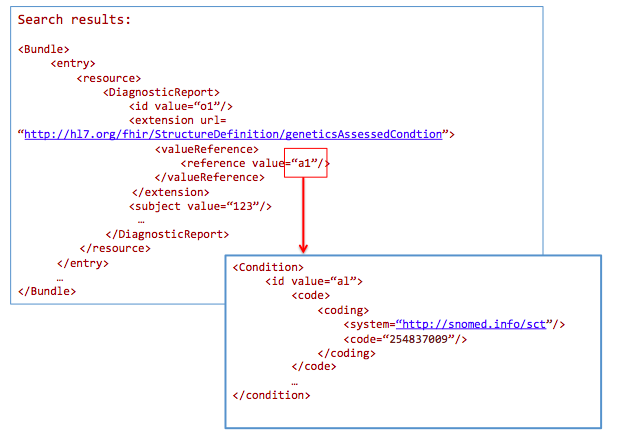 These are mappings from v2 and lonic code reference with details can be found in this list . Additional Observations instance will be created for variant's further analysis. 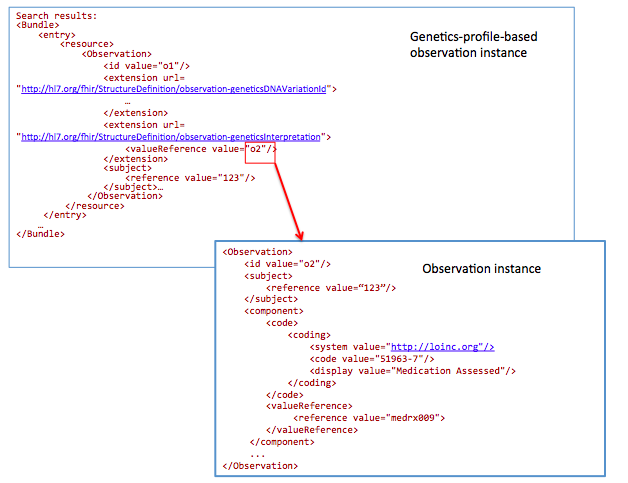 For example, Observation.component element will be used for knowledge-based interpretations of the sequence variant. Here are some examples for the component.code. 51963-7 Medication Assessed A coded medication accessed in a pharmacogenetic test (recommend RxNorm). 51967-8 Genetic disease assessed A coded disease that is associated with the region of DNA covered by the genetic test (recommend SNOMED). 53037-8 Genetic Disease Sequence Variant Interpretation Interpretation of the pathogenicity of the DNA Sequence Variant in the context of the assessed genetic disease. 53040-2 Drug Metabolism Sequence Variant Interpretation Predicted phenotype for drug efficacy. A sequence variant interpretation value known to allow (responsive) or prevent (resistant) the drug to perform. 51961-1 Drug Efficacy Sequence Variant Interpretation Predicted phenotype for ability of drug to bind to intended site in order to deliver intended effect. A Sequence Variant interpretation value known to allow (responsive) or prevent (resistant) the drug to perform. An example of an Observation instance which records knowledge-based clinical interpretations for the variant represented in A. An example of an Observation instance which records PCR validation test for the variant in A. We provide the following examples to reveal how PGx data can be harmonized within the FHIR specification. Detailed discussion will be put here. This DiagnosticReport-genetics is built on top of DiagnosticReport. The new profile is used to describe a genetics test report. The result element in DiagnosticReport will refer to the Observation resource that can lead to a bundle of genetic observations. The element of code, effective[x], issued, performer, request, specimen are be used to describe the details of the genetic test. Extensions about AssessedCondition and FamilyMemberHistory are added. Overall, this profile extends the DiagnosticReport resource to enable reporting of structured genetic test results. In addition, it denotes condition context for genetic testing, which may influence reported variants and interpretations for large genomic testing panels. The DiagnosticReport-genetics profile contains two extensions referring to other resources/profiles and one complex extension. AssessedCondition is used to denote condition context for genetic testing, which may influence reported variants and interpretation for large genomic testing panels. It refers to the Condition resource. FamilyMemberHistory are significant health events and conditions for one or more persons related to the patient. It refers to the FamilyMemberHistory-Genetic profile. Analysis provides knowledge-based interpretation of overall results of tests performed on patients. 51968-6 Genetic Disease Analysis Overall Interpretation Interpretation of all identified DNA Sequence variants along with any known clinical information for the benefit of aiding clinicians in understanding the results overall in either the context of diagnosis or increased risk of disease. 51964-5 Drug Efficacy Analysis Overall Interpretation Overall predicted phenotype for drug efficacy for all DNA Sequence Variants identified in a single case. 51971-0 Drug metabolism analysis overall interpretation Overall predicted phenotype for drug metabolism for all DNA Sequence Variants identified in a single case. An example of a genetic test report for a patient with FamilyHistory. An example of a comprehensive bone marrow report. To describe an order requested sequence variants detection. User must set up the code for the request and they can also refer to the corresponding sequence instance for that variant. Here is a diagnostic request for testing 185delAG variant. The mother of the patient received results from a mutation panel (eg. MyRisk from Myriad) and she has a BRCA1 185delAG mutation. The clinician the would like to request to test the patient only for an 185delAG mutation. In this case, the diagnostic request for the patient will specify the sequence variant - 185delAG. Human leukocyte antigen (HLA) genotyping is fundamental for research and clinical practice in immunogenetics and histocompatibility. Pointers to external locations refer to registered methods, raw NGS reads, and reference standards can be conveyed in this profile. Information about allele assignment including ambiguous results and the allele database used for assignments is stored in extensions. 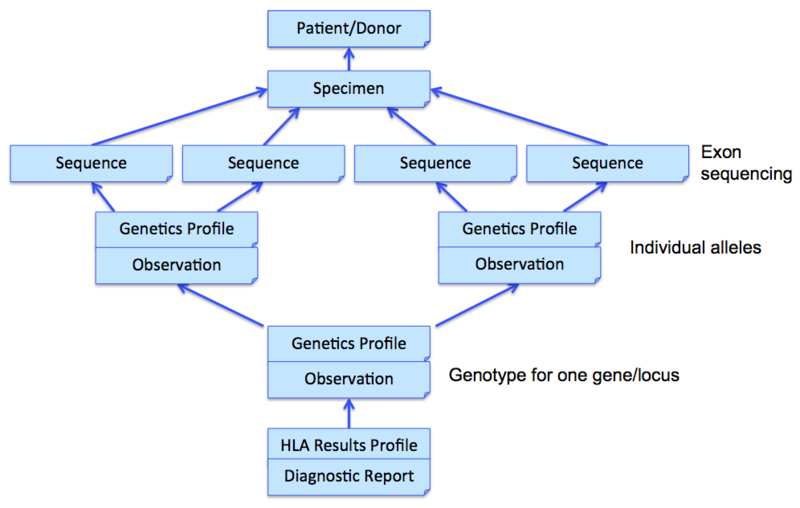 These principles were implemented in a technical specification by extending an existing XML based format for exchanging histocompatibility and immunogenetic genotyping data called Histoimmunogenetics Markup Language (HML) to include results from NGS methodologies (https://bioinformatics.bethematchclinical.org/hla-resources/hml/). The resulting schema may be found in https://schemas.nmdp.org/. The National Marrow Donor Program (NMDP)/Be The Match uses this format for reporting HLA genotyping from potential donors and for patients needing stem cell transplants. 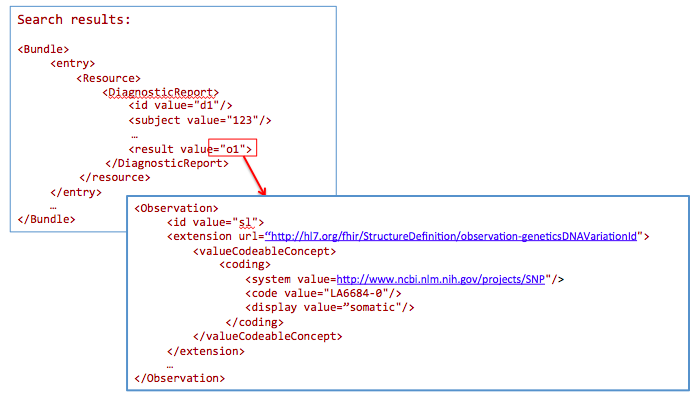 Both MIRING and HML were used to inform mapping data elements to FHIR resources such as Patient, Specimen, MolecularSequence, Observation-Genetic Profile, and DiagnosticReport where possible. Several additional data elements were needed specifically for this use case, resulting in the development of a specific profile for reporting HLA genotyping results (Diagnostic Report Profile for HLA Genotyping Results). Both hla-genotyping-results-glstring and hla-genotyping-results-haploid are complex extensions. The development of these extensions were informed from the allele-assignment structure found in HML. While allele assignment for individual loci can be reported in an Observation, here they are used to summarize the assignments at a report level. Two methods may be used for reporting HLA allele-assignments: Haploid and GL String. Haploid reporting is a method that is used to report an individual allele, or a list of possible alleles if the results are ambiguous, using NMDP Multiple Allele Codes (MAC) which is a shorthand for describing allele ambiguity (https://bioinformatics.bethematchclinical.org/hla-resources/allele-codes/). MACs are widely used for reporting HLA typing results because they are able to report long allele lists in a small amount of space, but the system has a number of shortcomings (Tissue Antigens. 2013 Aug;82(2):106-12 ). When reporting data using haploid, typical use is one or two haploid elements for a particular locus, but possibly more if multiple loci are covered (ex: two HLA-DRB1 haploids + one HLA-DRB3 haploid). Within Haploid, Method indicates whether the general methodology is DNA based typing (e.g., Sequence Specific Primers (SSP), Sequence Specific Oligonucleotide Probes (SSOP), or Sequence Based Typing (SBT)), or SER which indicates serology based methods. Because of limitations with MAC, another method called GL Strings was developed that encodes the results in a text string with hierarchical set of operators to describe the relationships between alleles, lists of possible alleles, phased alleles, genotypes, lists of possible genotypes, and multilocus unphased genotypes, without losing typing information or increasing typing ambiguity. (Tissue Antigens. 2013 Aug;82(2):106-12 ). url 0..1 uri glstring using a URI reference. text 0..1 string glstring using inline data. While the string format is easily parsed into separate components to be rendered for user viewing, GL Strings by themselves are potentially quite long and difficult to read. It often advantageous to point to a URI which may return the GL String on demand to avoid manual data entry. This is available through the URI element in this extension. Whether reporting in Haploid or GL String formats, it is important to identify the version of the IMGT/HLA allele database, as new HLA alleles are constantly being discovered and allele assignment is based on the known alleles at the time, and so results may need to be reinterpreted later. This is done through the Allele Database element. Overall methodology may be reported using hla-genotyping-results-method. Here a codeable concept may be used to refer to method entered into a public registry, such as the NCBI Genetic Test Registry, or a local private registry. In the above example, three Observations are referenced, each containing the details surrounding the genotyping of each gene/locus. Those observations would further refer to other observations (using Observation.related) that point to phased exon sequences which are the basis for individual allele assignment. This strategy is illustrated in the following figure for one gene, and sequencing two exons for each allele. Note that references from DiagnosticReport and Observation back to Patient/Donor and Specimen are not shown for clarity, although we would include them in the resource instances. MolecularSequence.pointer: A bundle of MolecularSequence instances can be connected by MolecularSequence.pointer to build sequence graph described in Section 3. MolecularSequence.pointer will point to the next sequence block. MolecularSequence extension in Observation-genetics profile: Observation-genetics profile is used to report a genetic variant found in patients. MolecularSequence extension contains a pointer to MolecularSequence identifier which has related sequencing read info. It will provide reference/observed allele information and quality scores for each base/sequence block. 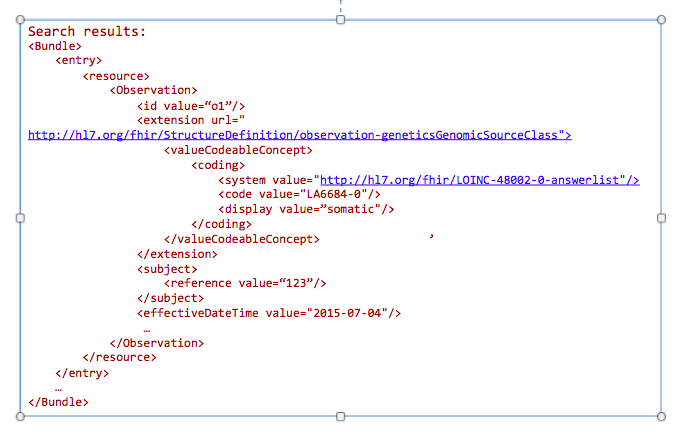 Observation-genetics based Observation resource is used for interpretative genetic data. MolecularSequence resource and genetics profiles will use internal pointers to Observation-genetics-profile based Observation instance for variant report. 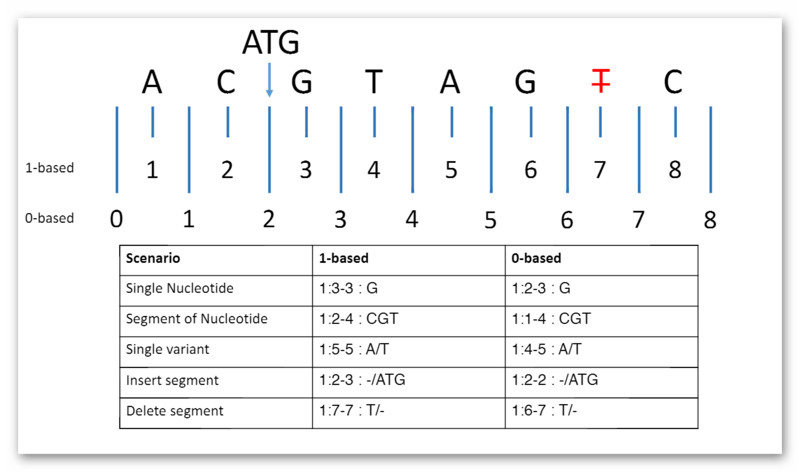 MolecularSequence.observation: A pointer to genetics Observation instance which is used for interpretations of this sequence block. Interpretations are generally about genetic variant found in this sequence block. DiagnosticReport.result: A pointer to Observation instance. This element is used for reporting genetic result. 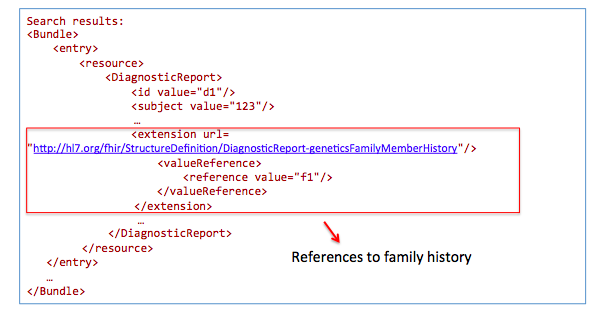 Item extension in ServiceRequest-genetics profile: It is used to describe the genetic test order. MolecularSequence is used for raw sequencing data while genetic-profile-based Observation resource is used for reporting interpretative genetic information (eg. DNA/amino acid variant detected in the patient). Although both MolecularSequence and Observation-genetics profiles contain variant info, they are used differently: MolecularSequence.variant is used for encoding the sequence block; the Observation-genetics profile is mainly used for a variants test result or interpretations of raw data in MolecularSequence resource. Here are the details and examples mentioned above. Haplotype: A haplotype is a set of DNA variations, or polymorphisms, that tend to be inherited together. A haplotype can refer to a combination of alleles or to a set of single nucleotide polymorphisms (SNPs) found on the same chromosome. Diplotype: A diplotype is defined as a specific combination of two haplotypes. Genotype: A genotype is an individual’s collection of genes. Phenotype: A phenotype is the composite of an organism’s observable characteristics or traits, such as its morphology, development, biochemical or physiological properties, behavior and products of behavior. Simulated use of the proposed MolecularSequence resource and profiles on other FHIR resources are shown for many of the examples in Section 5 – Use Case Scenarios in the HL7 Domain Analysis Model (DAM): Clinical Genomics, Release 1, September 2014 Informative Ballot . Get references to all variants obtained from germline analysis. Today clinicians translate (i.e. manually re-enter) genetic data into tools for decision making. This includes family history tools and drug dosage calculators. In the future, this data will automatically be incorporated into clinical decision making tools. LA6682-4: LOINC answer code for “Unknown Significance”. The goal of this profile methodology is to get references from all variants obtained from somatic analysis. Changes in the population of cells with particular mutations will change overtime as well as in conjunction with events such as therapy. For instance, targeted chemotherapy may kill a specific population of cancer cells with specific mutations and other cancer cell populations may survive and continue to divide. Therefore, clearly annotating these specimens as somatic variants and capturing annotations related to a time relevant to a treatment timeline may be critical for analysis. Today Registrars manually translate clinical data into public health reporting systems. This data is used to monitor and improve public health (e.g. surveillance and clinical research). In the future, this data will be extracted from the EHR in an automated (or semi-automated) fashion. Health data warehousing should persist data in its standardized formats, while allowing users to export subsets of the data in the warehouse into multiple ‘data marts’, optimized for specific use cases, analysis type or reporting needs. During the development of the FHIR Genomics design, CGWG participants have commented on the earlier use cases and/or proposed new use cases. In this section, we list describe of these new cases and demonstrate how the proposed design will address them. This example is proposed by Kevin Hughes. Family history is useful for clinicians to know more about the condition of the patient. 34193-3: LOINC code for “SMPD1 gene mutations tested for in Blood or Tissue by Molecular genetics method Nominal"
53035-2: LOINC code for “DNA marker assessed"
7272398008: SNOMED code for “ Inheritance types "
The idea for a MolecularSequence resource grew out, in part, the SMART Platforms Project, which explored creating clinical genomic apps to integrated traditional EMR clinical data and genomic data to show data visualization and analysis, including CDS that depended upon both types of data. Below are a couple of examples. Several apps have already been designed including Genomics Advisor, SMART Precision Cancer Medicine, and Diabetes Bear EMR. Below, one of these apps will be described. To include other apps in this section, please feel free to add a note on it and how it uses FHIR/Genomics calls. The table shows how the data elements in the DSTU2 Observation resource as extended by the Standard Genetics Profile would be mapped to the new MolecularSequence resource.